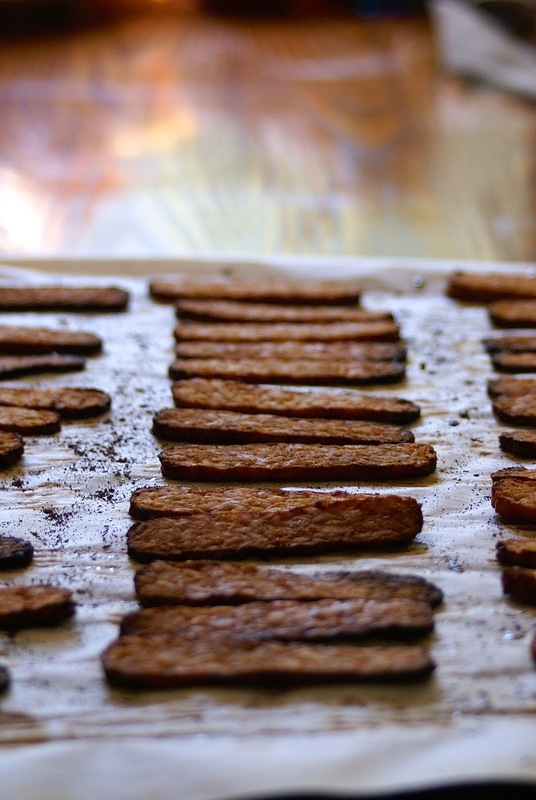 Smoky Tempeh Bacon For All! Delicious meatless bacon is possible! This bacon is like no other. Probably because it’s made out of tempeh, not a hint of pork in site! Now I love pork bacon as much as the next person, however sometimes it’s time to step away from the pork to go vegetarian on one of America’s favorite meats. Tempeh is by far my favorite way to eat soybeans. (Check out this post, where I talk about all the health benefits tempeh offers.) It has a meaty texture, making it the perfect food to create vegetarian bacon out of. 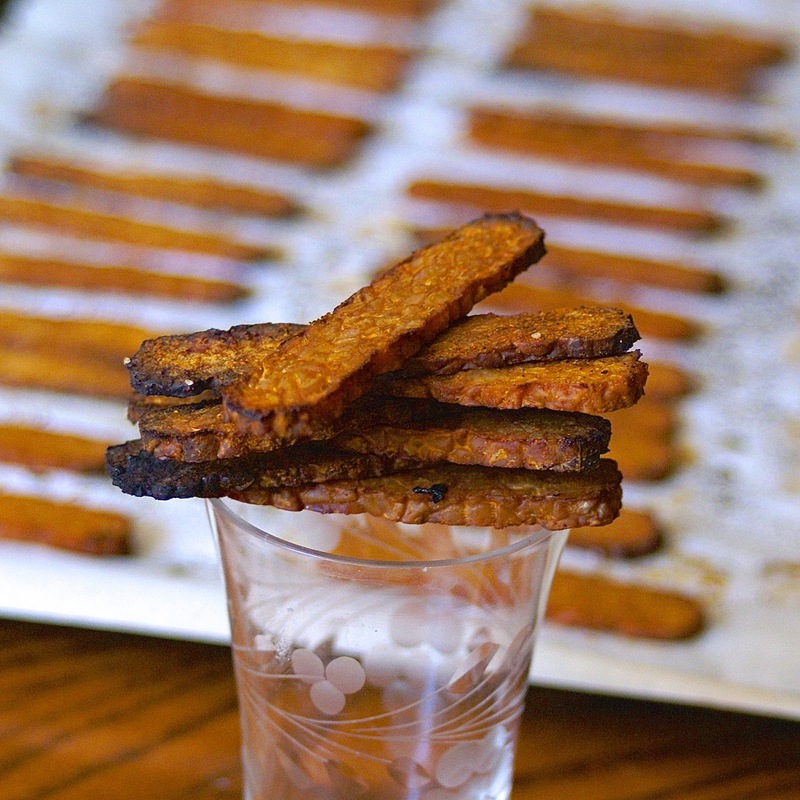 When it is thinly sliced, with a touch of maple syrup for sweetness and smoked paprika for that bacon-y flavor, this tempeh bacon is out of this world! The key to getting a lot of flavor is marinading the sliced tempeh for at least twenty-four hours. It takes a bit of thinking ahead, but it is so worth it. I have been making a double batch and freezing leftovers so next time I want some, I simply pull it out of the freezer. They freeze very well. My best friend is a vegetarian and I always make a meatless meal when she comes over for dinner. This summer I have been making a lot of BLT’s* with all my garden tomatoes, and always feel guilty that she can’t enjoy such a delicious sandwich. With this tempeh bacon, that all changes. Now she can enjoy BLT’s, or TLT’s! Even I have been byapssing regular bacon on my BLT’s for tempeh bacon! 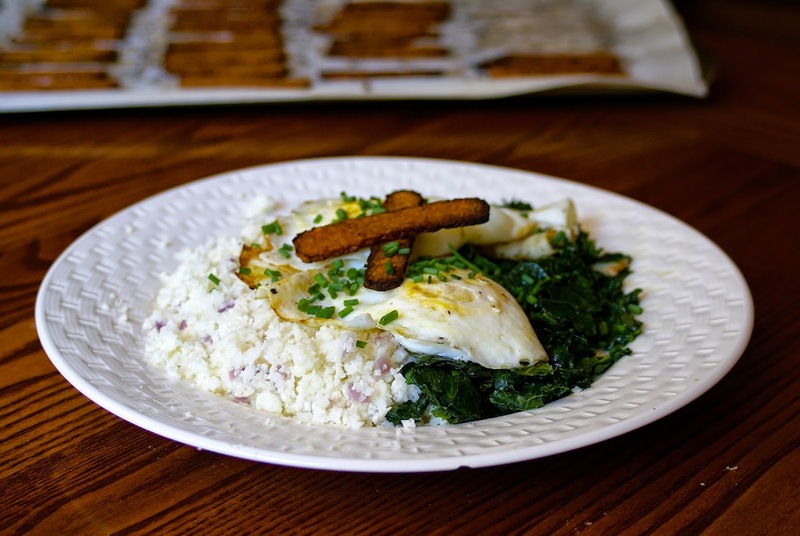 Some of my favorite ways to enjoy this tempeh bacon are with fried eggs, as a vegetarian spin on bacon and eggs, or popping them as a pre-workout/post-workout snack. They are salty, sweet, and savory, all while packed with plant protein and fiber. Swap out regular bacon for this tempeh version every once in a while, enjoying a healthy vegetarian option without sacrificing that wonderful bacon flavor! * I make my BLT’s by smothering pesto or mashed avocado on a large lettuce leaf, add a large slice of tomato, then copious amounts of free-range, organic bacon, before topping with another lettuce leaf. They are so good, I felt the need to share this with you! 1. Use tempeh bacon to garnish this Beet Pasta with Spicy Broccoli Rabe. 2. Dip in Heavenly Hummus! 3. Serve as a side with Fried Eggs over Sweet Potato Hash. 4. Swap regular bacon for tempeh bacon and make this Cherry Tomato and Bacon Pizza. 5. Top these Stuffed Mushroom Poppers with a piece of crispy tempeh bacon. 6. Add a tempeh bacon to this Tempeh Salad Sandwich to amp up the flavor! 1. Thinly slice the tempeh block 1/8″ thick. Mix the oil, vinegar, maple syrup, paprika, salt, and pepper together in a small bowl. 2. Carefully add the sliced tempeh to a large ziplock bag, then pour the marinade over it. Get all the air out of the bag, then seal it. 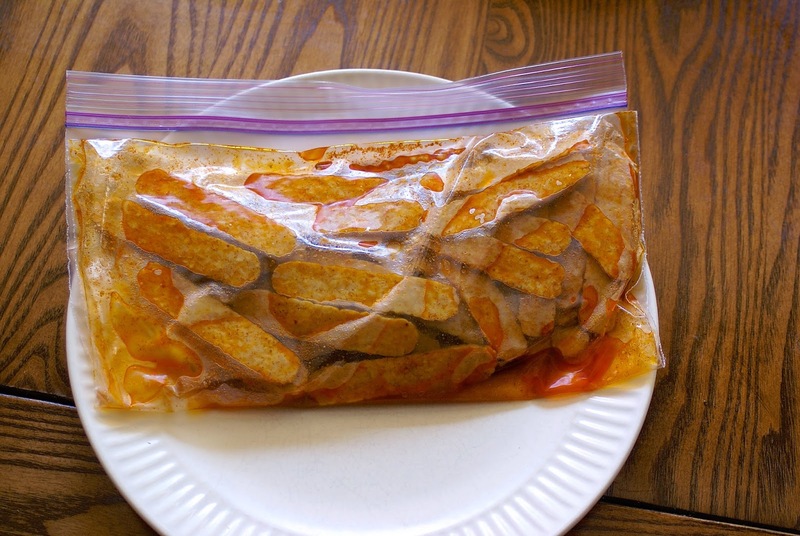 Let sit in the refrigerator for 24-48 hours, flipping the bag half-way through. You can marinade the tempeh for a shorter amount of time if necessary, however it has the most flavor when you give it at least 24 hours. 3. 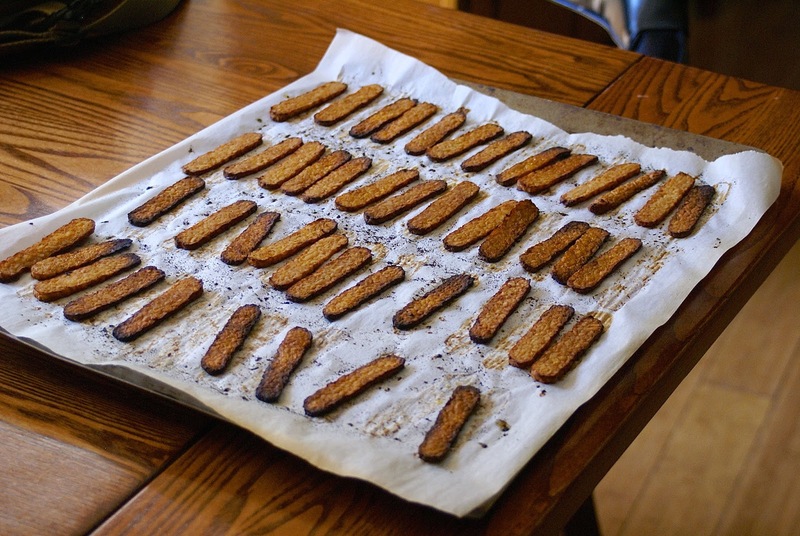 Preheat the oven to 400 F. Line a baking sheet with parchment paper. 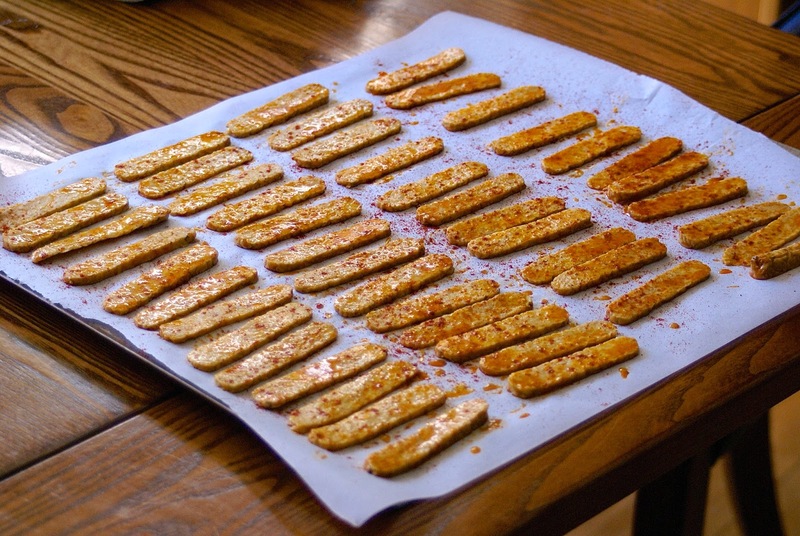 Remove the tempeh strips from the marinade bag and spread them over the parchment paper in a single layer. Sprinkle with additional smoked paprika and sea salt. 4. Bake for 8 minutes in the preheated oven, then flip them and sprinkle the other side with additional smoked paprika and sea salt. Bake another 5-7 minutes, or until the outside edges start to blacken.